Our association is broadly known for maintaining the quality in offering Jute School Bag. This School Jute Bags is eco-friendly and made from natural jute, with special handle & 4 color screen printing. The bag is used by Delhi public schools for books distribution. 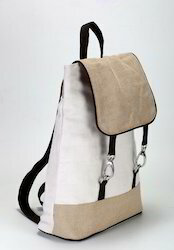 Product Details: Bag TypeBackpackHeight16 inchWidth6 inchClosureZipperNo of Pockets3 Product Description: Owing to the rich industrial experience and expertise in this business, we are engaged in providing Jute School Bag. In order to keep pace with the never-ending demands of customers, we are involved in offering a wide range of Jute School Bag. Matching up with the requirements of our clients, we are involved in offering Jute School Bag. We are counted as prominent name in this domain, involved in offering a wide range of School Jute Bag to our clients. This School Jute Bag is made with fine quality of material and enriched with sharp edge technology. To avail the demand of our clients, we are offering this product at market leading prices. 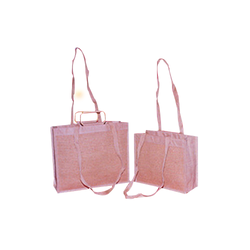 Our company holds immense experience in this domain and is involved in offering wide assortment of School Jute Bag.